Taro Ground is the highest point on Pitcairn Island where the commercial radio station is located. When my plans to visit Pitcairn island for a DXpedition were published a US ham sent an e-mail to me just asking this question: Why Pitcairn? He probably meant that nobody should go on a serious DXpedition to such a semi-rare country as Pitcairn is - at least for non-Europeans. I shall try to answer that question now. Tom (VP6TC) and Betty (VP6YL) Christian with daughter Darlene. Planning the VP6BR Pitcairn DXpedition has gone through many stages. As long as I remember, to visit Pitcairn Island and operate an amateur radio station there has been my dream. The main reason for this dream is the fact that Pitcairn is the most distant permanently inhabited place looking from Finland. Accordingly, a QSO between Pitcairn and Finland is not a commonplace event. Earlier, in Finland we believed that Mexico is a 'black hole' for us and a QSO is next to impossible. Now things have changed and the most elusive DXCC entity from a Finnish point of view is, in my opinion, Pitcairn Island. Morover, the Pitcairn island group includes two rare IOTA countries, namely Henderson and Ducie. 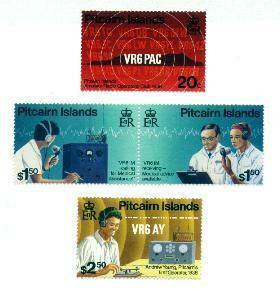 I earned my licence in 1960 but my first QSO with Pitcairn was established only in 1970 with Tom, then VR6TC, on 20 m SSB. In 1979 I worked the DXpedition station VR6HI on 15 m CW but never found out who the operator was as I did not get the QSL card. HAM stamps series from the Pitcairn Bicentennial. In 1987 I was lucky to have a QSO with Tom's XYL Betty, VR6YL, on 20 m CW. 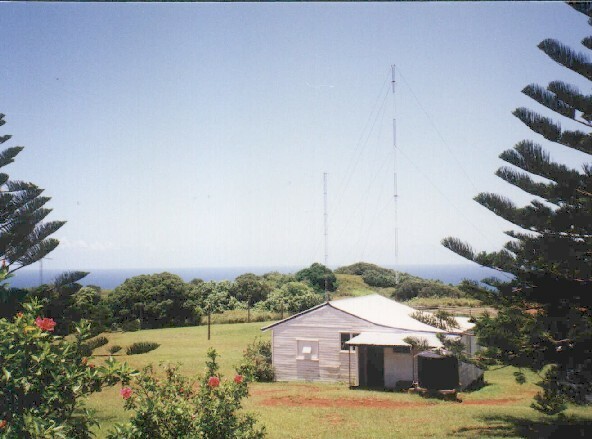 After that, I have only once heard a signal from Pitcairn, when Betty was calling CQ on 40 SSB some five years ago. Unfortunately, southern Europe was having better propagation so a QSO between us did not take place. In the end of April 1999 with Russian trade - my bread and butter - being at a very low level I decided that now it must be the perfect time for a DXpedition to Pitcairn. I had studied the Pitcairn web pages so I roughly knew where I was heading. I faxed a letter to Tom and Betty - who else - asking if they would care to have me as their guest and let me do some serious DXing. To be sure that they had received my letter I phoned via INMARSAT and had a short but warm conversation with Betty who confirmed that they will discuss my proposed visit with Tom and let me know in due time. Sure enough, their letter with a positive reply arrived after a month through Howie WA6TUJ, who has regular skeds with Tom on 15 m.
As Tom had advised me to contact the Commissioner for the Pitcarn Islands, Mr. Leon Salt in Auckland NZ, I soon had all the details how to apply for the Licence to Land and Reside on Pitcairn. I also received the Notes for Visitors and an Island Council Questionnaire to be filled, too. HAM Radio is a way of life on Pitcairn. 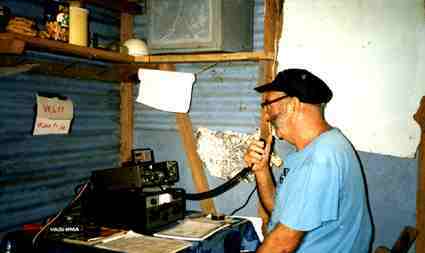 Jim Russell G3OKQ of Surrey, England, operating from Pitcairn Bicentennial. In the beginning of August I was ready to send in my application and two character references required to be attached to it. A prompt reply by e-mail from Mr. Salt confirmed that he had found my application to meet their standards and had reserved the requested call sign VP6BR - I just love my suffix Bravo Radio - for me to be picked up at my arrival in Auckland. He even told that VR6BR had been assigned to Betty Rauch but she had never that call sign reissued as VP6BR so it was free, but perhaps I should like VP6OH better! Now this was the most considerate reply from a government official I have ever seen. Mr. Salt also put me on their list for the first ship in the New Year 2000. Another e-mail soon after that told me that the Pitcairn Council had approved my application and in his reply, the Island Magistrate has confirmed that I shall be accommodated with Tom and Betty Christian. At that moment I knew that my dream could be true - to visit the most desolate but still inhabited island on the face of the Earth, meet some of my dearest DX friends and be the hunted DX myself! All these reasons are quite enough for me to give a very positive and firm answer to the question made earlier. Why Pitcairn? Because Pitcairn IS! 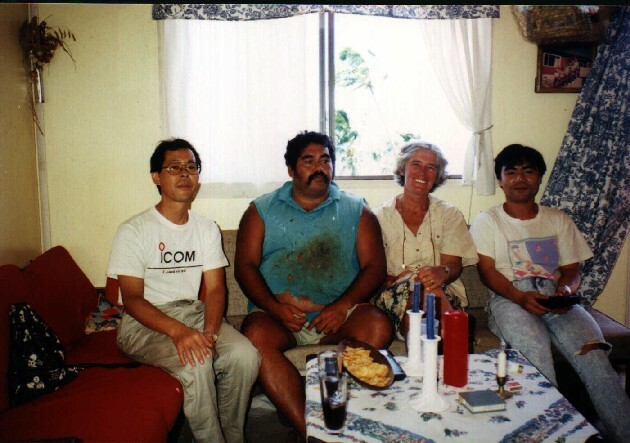 We, Hiro JA1SLS and I JF2MBF had a great trip and radio operation on Pitcairn in 1993. We want to thank Mr & Mrs Harraway, British Consulate General in Auckland, our many radio friends, Tom and Betty Christian and Pitcairn islanders for making our journey possible. Hiro VR6BB, Brian Young VR6BX, Kari Boye Young VR6KY and Nob VR6JJ in Kari and Brian's home. After 3 weeks of waiting in Auckland, New Zealand, we finally could secure boarding tickets for Pitcairn Island. We left Auckland on Jan 3th 93 and it took us a week to reach Pitcairn Island. On the way we could see only ocean except Rapa Island in French Polynesia. We did not feel like unpacking our equipment and trying to get on the air as /MM. Instead, we enjoyed nice food, washing clothes, watching ocean from the bridge etc. We arrived in close proximity of Pitcairn early in the morning of Jan 11th 93. The island was covered with clouds and looked very mysterious. Our host family was Tom VR6TC and Betty VR6YL who are well-known hams. As we had planned we could activate 160m, 6m, CW and RTTY during our stay. Pileups on CW were remarkable. Hiro JA1SLS left in early March after his great CW operation. Apart from hamming he was very popular among islanders as a repairman. I decided to stay on the island a month more but not a single ship stopped by during April. I took things quite easy, though, because I felt so comfortable to stay thanks to Tom, Betty and all the other islanders. Some people who asked me How much longer will you stay? can now understand why I always answered Until the next ship comes. 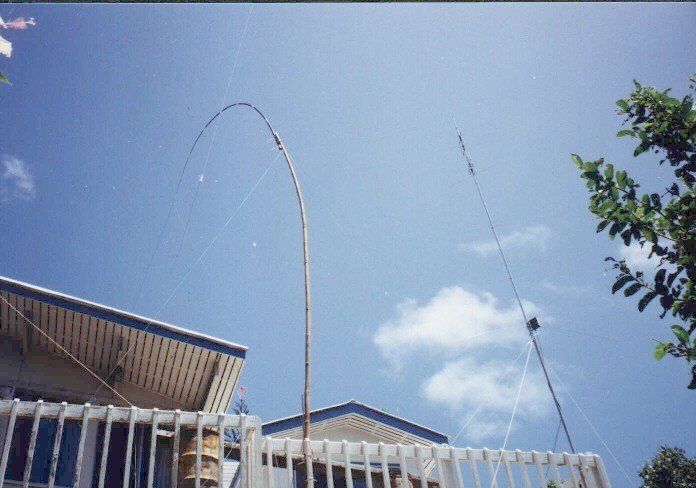 Invereted L for 160m and R5 vertical in the corner of Tom and Betty's house. We had power for 6 hours in a day and run with batteries rest of the time. However, we made a total of 35,000 QSOs (70% on CW). May 13th 93 was the day I finally left Pitcairn and sailed back to Auckland to start another string of operations on ZK1/S, ZK1/N, T2, T30, A35, C21 and 3D2. Our equipment in Pitcairn included two TS-690s, a FT-690 (6m backup rig), amplifiers FL-2100Z and HL-166V for 6m (200W). Antennas used were 160m Inverted L, HF-2V vertical for 80-30m, 1/4 wave sloper for 80m, R5 for 20-10m, and 4 elements Yagi for 6m. Operating site was in the corner of Tom's and Betty's house in the first floor. Besides DXing, we enjoyed the local food, especially fish food, and desserts. The Pitcairners love to have a party with tables full of delicious dishes. I still dream of Betty's fish meatballs and I gained 10 kg weight during my stay. Going fishing with Tom and the other islanders is something worth recommending. Thanks to our QSL manager JF2KOZ all QSLing has been already completed. He answered all direct QSLs, all bureau QSLs and sent QSLs via bureau for those who did not QSL to him at all. We will close both VR6BB and VR6JJ logs soon but if someone still needs a QSL please feel free to contact me at [email protected] as we still have a bunch of QSLs left. We hope that Jukka OH2BR will have a great DXpedition as VP6BR and be stuck on the island for a long time to make more hams happier than he ever expects.